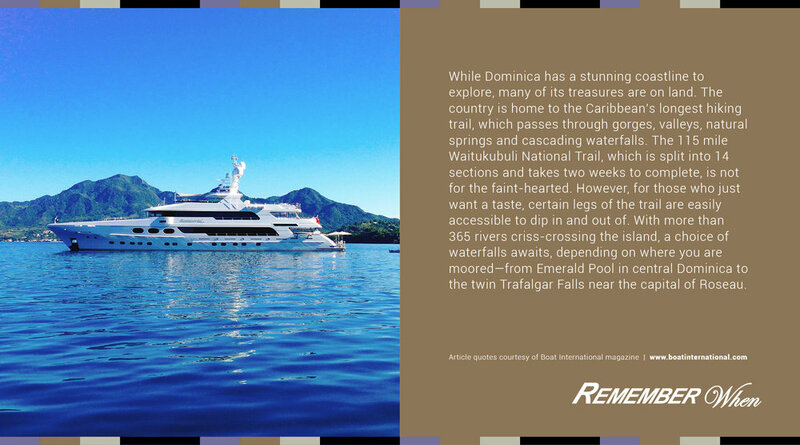 Remember When is proud to be featured in Boat International magazine with a detailed narrative about an unforgettable journey into Dominica, a well-kept Caribbean secret. Nicknamed Nature Island, Dominica’s mountainous landscapes promise new adventures. Sophia Wilson discovers the Caribbean’s wild side in luxury, on board Remember When. The isle is full of noises, sounds and sweet airs, that give delight and hurt not,” says Caliban in Shakespeare’s The Tempest, when describing his deep devotion to the island on which the play is set. The true location of the island is a matter of academic debate but arguably the rugged volcanic topography and lush forests of Dominica offer an equally mystical modern day alternative. The island experienced its own tempest in 2015 when Tropical Storm Erika struck. The deadliest natural disaster in Dominica since Hurricane David in 1979, it killed 30 people and destroyed hundreds of homes. Despite a valiant recovery effort, the scars are still visible—roads are in need of repair and temporary structures replace most of the shoreside bridges that were washed away in the storm. However, driving along the twisting roads past deserted black beaches, tropical green forests and mist covered mountain peaks, I am instantly enchanted by my surroundings: this is no typical Caribbean island. 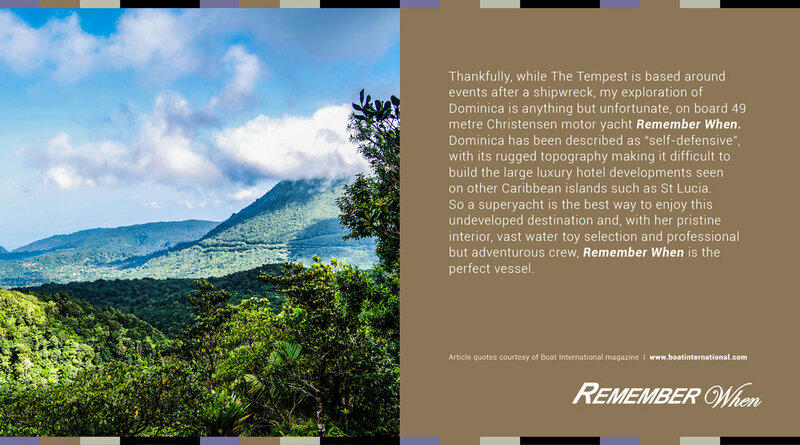 Thankfully, while The Tempest is based around events after a shipwreck, my exploration of Dominica is anything but unfortunate, on board 49 metre Christensen motor yacht Remember When. Dominica has been described as “self-defensive”, with its rugged topography making it difficult to build the large luxury hotel developments seen on other Caribbean islands such as St Lucia. 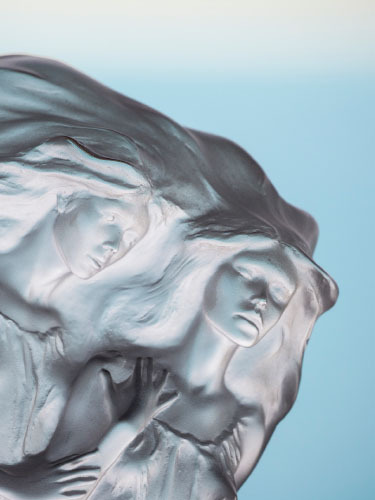 So a superyacht is the best way to enjoy this undeveloped destination and, with her pristine interior, vast water toy selection and professional but adventurous crew, Remember When is the perfect vessel. While Dominica has a stunning coastline to explore, many of its treasures are on land. The country is home to the Caribbean’s longest hiking trail, which passes through gorges, valleys, natural springs and cascading waterfalls. The 115 mile Waitukubuli National Trail, which is split into 14 sections and takes two weeks to complete, is not for the faint-hearted. However, for those who just want a taste, certain legs of the trail are easily accessible to dip in and out of. We opt for a short walk around the Syndicate Nature Trail, in the foothills of Morne Diablotin, Dominica’s tallest mountain. Morne Diablotin National Park is home to two species of parrot, the Jaco and the Sisserou, the latter of which adorns Dominica’s flag. Their vivid emerald feathers and shrill shrieks make them easy to spot as we stop on a platform looking across a lush green gorge. As impressive as the wildlife are the Sloanea caribaea trees, whose buttress roots stretch across the forest floor in search of nutrients. Dominica's luscious rugged terrain beckons Caribbean travelers. Just a short drive from the Syndicate Nature Trail lies another of Dominica’s natural assets—Milton Falls. With more than 365 rivers criss-crossing the island, a choice of waterfalls awaits, depending on where you are moored—from Emerald Pool in central Dominica to the twin Trafalgar Falls near the capital of Roseau. The hike to Milton Falls winds up a boulder-filled river path and takes about 45 minutes to complete. A hundred metres from the waterfall we need to cross the river and my guide hands me a vine with which to swing across. Thankfully my inner Tarzan surfaces and just around the corner I am rewarded with the sight of a 25 metre cascade of water crashing into the pool below. After a less than dignified change of clothes behind a nearby rock, I enter the crystal clear waters of the cool pool beneath the waterfall. The icy water and powerful flow is the perfect way to rediscover your inner child and the beauty of Dominica is that you get it all to yourself. As we walk back from the falls the guide climbs up the side of the embankment and returns with a bunch of grapefruit, which he cuts open and serves. It is without question the best grapefruit I have ever eaten, both sweet and juicy. Dominica’s climate means that it is bursting with natural produce and throughout the day the group is presented with fresh coconuts and cocoa, as well as a vast selection of spices and herbs. It is this natural produce that the nation credits for the health of its older population and the longevity of Ma Pampo, who it was claimed was the oldest person in the world before she died at the age of 128 in 2003. Her celebrity status remains, with paintings of her across the island, and I defy any visitor to speak to a Dominican without her life being mentioned. While Dominica still has a raw beauty, Remember When is there to offer the luxuries expected from a Caribbean charter. After a day exploring there is plenty of time for a sundowner in the spa pool or an opulent soak in the master suite’s vast bath before a delicious meal prepared by chef Daniela Sanchez. Runner-up at last year’s Antigua Charter Yacht Show chef’s competition, Sanchez creates meals that combine her love of different cultures and her natural ability to balance flavours and spicing—from seared tuna with polenta to chilli chocolate pudding. Unfortunately, no matter how luxurious the superyacht, one element always remains out of the control of the captain and crew—the weather. While Dominica has consistent yearround temperatures, ranging from 21˚C to 28˚C, the vibrant green of the island doesn’t come without significant annual rainfall. I wake one morning to never-ending sheets of rain—Portsmouth in Dominica bears a remarkable resemblance to the grey colours of Portsmouth in the UK in December. 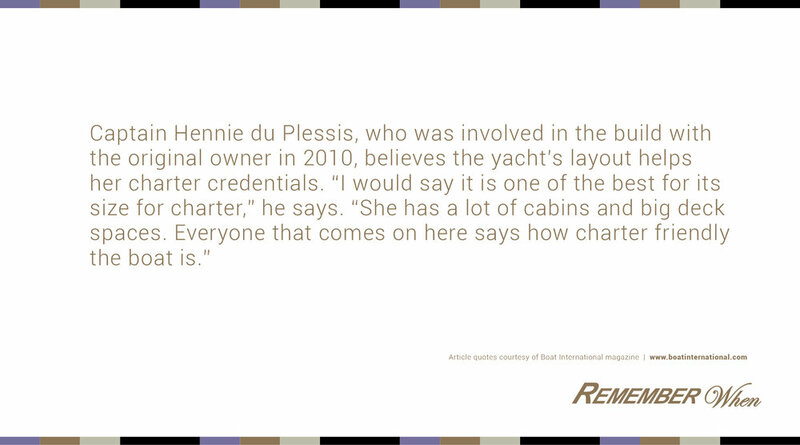 However, it is occasions like these that truly test a charter crew. After all, it is easy to show guests a good time when the sun is shining, but it is a new challenge altogether when Mother Nature decides to spoil the party. Unfazed by the situation, the crew steps in to ensure all guests are entertained. Despite expecting us not to be on board, a three course “light” lunch is produced, chief stewardess Bianca Franck hosts a wine and cheese pairing and we are invited into the galley to learn how to make plant pot chocolate puddings. Nothing is too much trouble for this crew, from hosting Alice in Wonderland themed lunches to taking basketfuls of mud-stained clothes after hiking and returning them freshly ironed to my cabin. Once the rain has cleared I am able to discover another of Dominica’s star attractions, the Indian River. No motorised boats are allowed on the 4.3 mile stretch flowing between the town of Portsmouth and the village of Glanvillia, so instead Cobra rows us upstream as the canopy closes in overhead. With its mangrove-lined banks and mineral green water, I feel like I am venturing up the Amazon rather than messing about in the Caribbean. En route we row into an inlet with a wooden shack perched on the bank, which was used as the set for Tia Dalma’s cottage in Dead Man’s Chest, the second film in the Pirates of the Caribbean series. Surrounded by gnarled mangrove roots and large fern leaves, it is not hard to see why producers chose the location. Once back out on the main stretch of river, we begin to hear the distant sound of a saxophone floating through the trees and before long a jetty comes into sight. 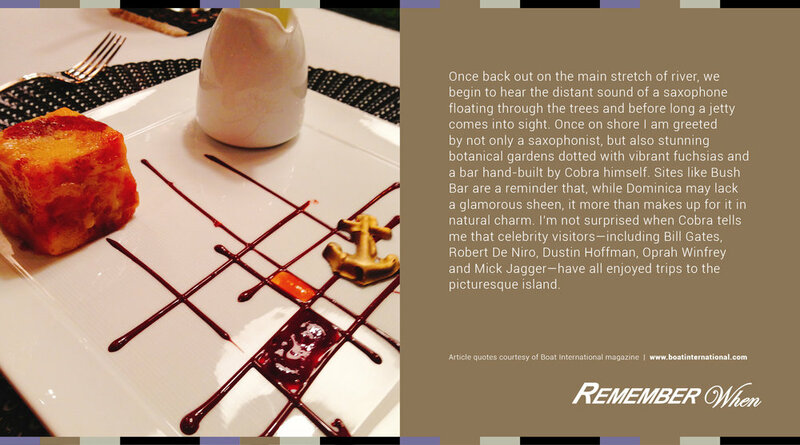 Once on shore I am greeted by not only a saxophonist, but also stunning botanical gardens dotted with vibrant fuchsias and a bar hand-built by Cobra himself. Being both young and foolish I opt to try the signature cocktail—the Dynamite. As its name suggests it packs a punch and is probably only recommended for those who have a penchant for paint stripper. If you fancy something a little less lethal opt for the passion fruit rum punch instead. 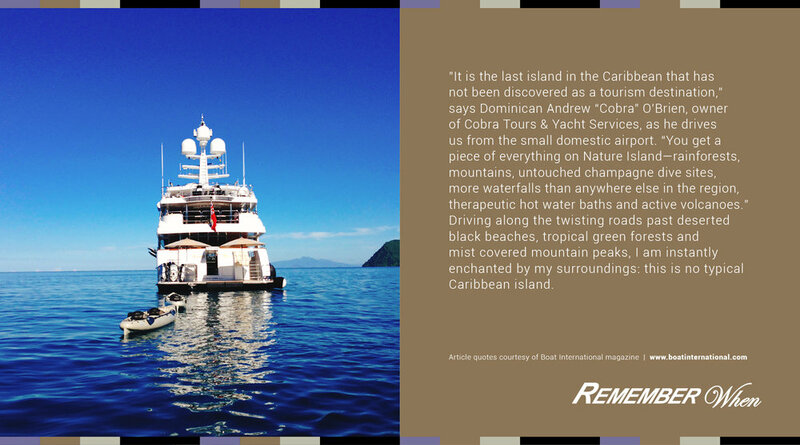 162' Christensen Motoryacht Remember When is prepared to pamper guests in style after a day of adventures in Dominica. Sites like Bush Bar are a reminder that, while Dominica may lack a glamorous sheen, it more than makes up for it in natural charm. I’m not surprised when Cobra tells me that celebrity visitors—including Bill Gates, Robert De Niro, Dustin Hoffman, Oprah Winfrey and Mick Jagger—have all enjoyed trips to the picturesque island. Despite it being Du Plessis’ first visit to Dominica, he has also succumbed to the island’s attractions. “Every Caribbean island has its thing but Dominica is something special,” says the captain. 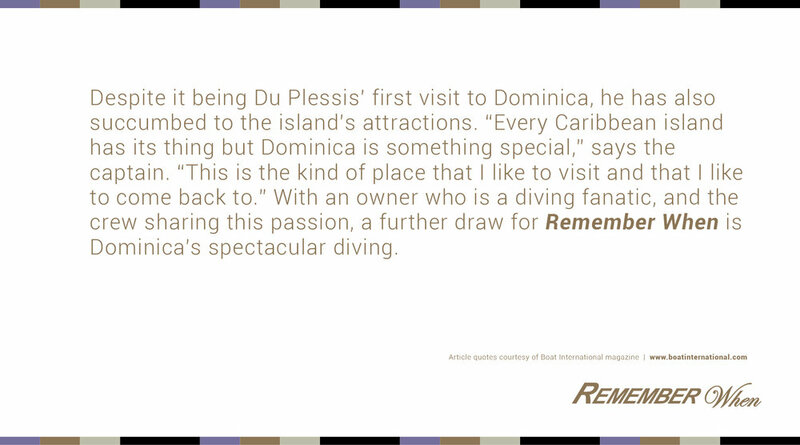 “This is the kind of place that I like to visit and that I like to come back to.” With an owner who is a diving fanatic, and the crew sharing this passion, a further draw for Remember When is Dominica’s spectacular diving. Possibly the most famous is Champagne Reef, which as its name suggests is famous for the tiny bubbles that are released through holes in the reef from the volcanic activity underneath. The beauty of Champagne Reef is that it is directly accessible from the shoreline. Companies such as Champagne Reef Dive & Snorkel can organise a private divemaster to lead you through the coral gardens full of healthy reefs, tubes, sponges and colourful fishes and the 23 metre descent. And while the attraction is best experienced by diving, you can still enjoy the gently bubbling spectacle while snorkelling, if you prefer. Despite spanning just 290 square miles, you could take weeks rather than the few short days that I have to explore Dominica. Leaving the island and cruising for 10 hours overnight we awake to find ourselves arriving in the newly created UNESCO World Heritage Site of Nelson’s Dockyard in Antigua. 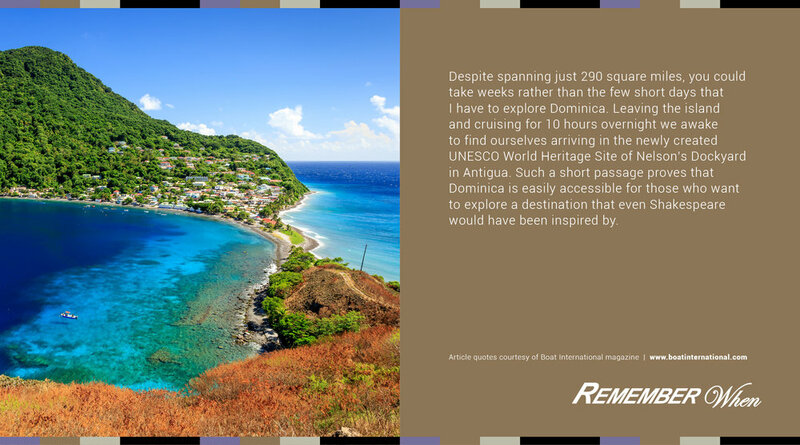 Such a short passage proves that Dominica is easily accessible for those who want to explore a destination that even Shakespeare would have been inspired by. Remember When at the FYBA Charter Open House in Fort Lauderdale. The crew of 162’ Christensen Motoryacht Remember When was very happy to host Fort Lauderdale charter agents, brokers, media and various industry professionals for a lovely soiree including delicious cocktails and canapés, following the FYBA Charter Seminar Open House at Bahia Mar. 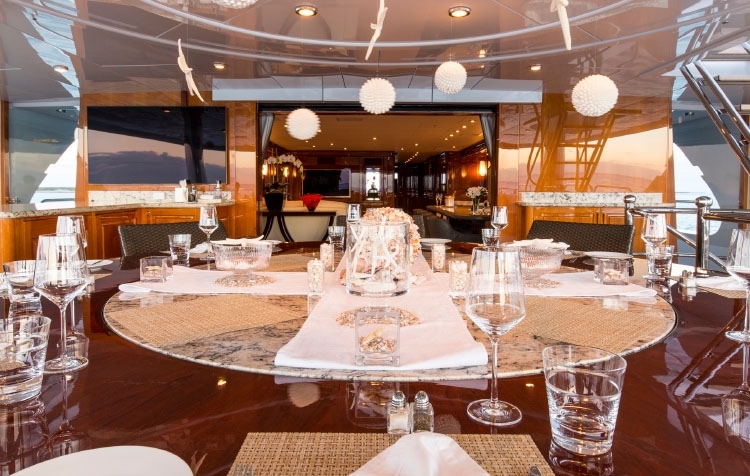 Guests were received by charter experienced Captain Cisco Chadinha and the attentive team of Remember When who provided detailed tours of the interior accommodations, social areas and beautiful exterior decks. The yacht was fully decorated to show-standards and guests were impressed by the elegant and detailed tablescapes, flower arrangements, and even a perfect exercise equipment setup on the sundeck showcasing the fitness possibilities onboard, including treadmill, rowing machine, free weights, yoga mats, steps and more. On the water, the 42’ Towed Tender fully equipped for fishing was also on display off of the ample swim platform. 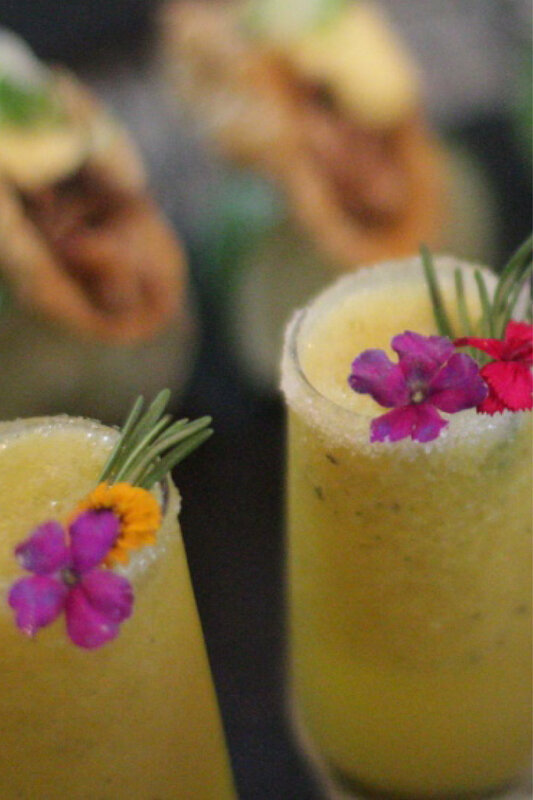 The Wildflower Margaritas were a sensation—besides being tropically gorgeous—the delicate spicy touch of each drink got everyone talking and craving for more. 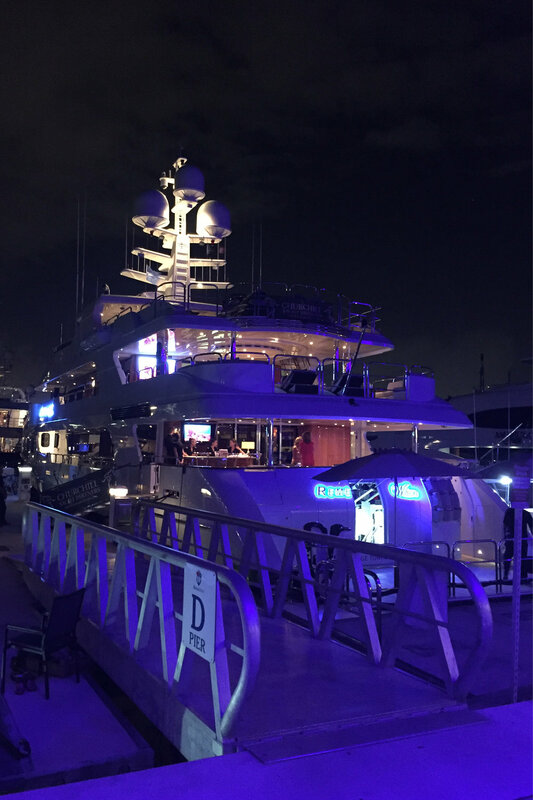 The highlight of the evening was truly the attentiveness of the crew of Motoryacht Remember When who are an example of what the yachting lifestyle is all about—luxury, attention to detail, professional 5-star service, and a positive vibe that ensures everyone has a fabulous time. Private viewing events such as the FYBA Charter Open House offer an outstanding opportunity for brokers and agents to get to know yachts and their crew and Remember When is grateful to all guests for such a wonderful turnout. To charter is to indulge in the journey, to celebrate the beauty of life, to breathe anew. Step aboard the 162' Remember When to embark on the journey of a lifetime, where the wonders of new worlds delight and magical moments surprise at every turn. Relax and unwind in elegant comfort as your professional crew and personal chef cater to your every whim. Whether you’re seeking active adventures under a Caribbean sea, or the leisurely discovery of treasures along the East Coast, it’s time to let the journey begin. Remember When hosts 12 charter guests in 6 spacious staterooms, catered to by a professional crew of 10–11. Visit us often for updates on destinations, itineraries, menus, special events and much more.